Shiloh Hour is a divine vision, the Lord gave to Bishop Jonathan. It is an interdenominational prayer and deliverance service with great high praise. It all started on a very humble beginning few years ago but now to the glory of God, it attracts people of all works of life, nations and tongues in great numbers. 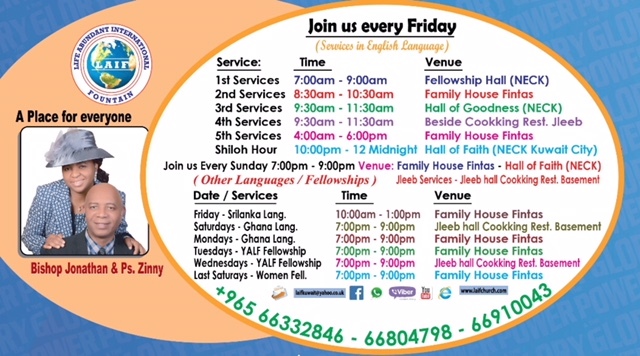 It holds on every Friday at Hall of Faith N.E.C.K Compound by 10pm till 12 mid night. God has been using this forum to do the impossible in the midst of His people in this land, destroying reoccurring problems, sickness and setting the captive free. Like Hannah in the bible, people with various difficult unanswered prayers have received amazing testimonies in Shiloh since inception, irrespective of their church affiliation or denomination. This vision came from 1 Samuel 1:15, according to the bible, Hannah went up yearly to Shiloh, the house of God (House of prayer) with the problem of her barrenness year after year. But one day came, she welled up in her faith and made up her mind that enough was enough. She poured out her Soul before the Lord and the Lord heard from heaven and answered her. We thank God for Keeping to His promises towards us since inception of this awesome programme. As you come by faith, may you be the next to testify in Jesus name.